Last year, Flightlines wrote about military “Bronies” – guys who are really into “My Little Pony – some of whom like to wear “Pony” patches on their military uniforms. To be clear, Bronies do not advocate wearing “My Little Pony” regalia on military uniforms, but one class of airmen learning how to fly incorporated the Brony ethos into its temporary class patch. 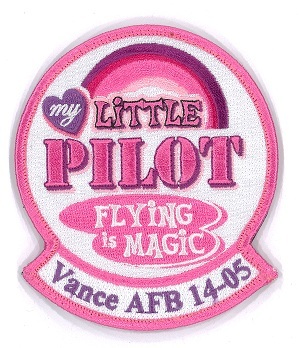 Like all class patches, the Brony patch for Class 14-05, which is training at Vance Air Force Base, Okla., is unofficial and only worn during pilot training, said 1st Lt. Thomas Barger, a spokesman for the 71st Flying Training Wing. Because airpower is like friendship: Magic. I used to collect UP patches, but stopped when I lost interest several years ago. However… I. WANT. THAT. PATCH!!! And these are the people who will have Hell Weapons at their fingertips, bombs and missiles that can obliterate a city in an instant and destroy all higher life on Earth. Why do I suddenly feel a cold chill? Because you obviously don’t understand warfare, modern weaponry, or any information outside of whatever Pat Robertson has told you, A. Nuran. How can I get one of those patches? Can they be ordered? My Dad’s squadron patch was Felix the cat on a cloud above a periscope. Lord knows the history of animated characters on squadron patches goes back to WWII. (Woody Woodpecker was a favorite.) They’re just carrying on a proud tradition. I’d like to bring to your attention that the website you’re citing as a source is actually called “Equestria Daily”, not “Equestria Nightly”. You were probably mislead by the blog’s header which, at that time, actually spelled “Nightly”. That happens sometimes (in this case it was to celebrate a fanmade video starring Luna, the ‘Princess of the Night’); however, the domain can be easily verified to be equestriadaily.com (and the header does recite so right now). Just letting you know. Nice and funny article, otherwise. Ha ha, he thought “Equestria Nightly” was the site’s name!